When Brad and I moved to Tokyo in 2008, all I could do to keep from curling up in a ball of homesickness was to look for things about Japan that reminded me of my Midwestern home. Let me just say that finding similarities between Minnesota and Japan is not an easy task. Sometimes I would find ways of preparing food that reminded me of home. Occasionally I would see a sign for Minnetonka Moccasins that would make me feel like I still had a connection to my home state in the midst of the strange new surroundings in which I now found myself. I had an inkling moving to Japan might be difficult in the beginning. It was half way across the globe, after all. What I didn't expect was having similar feelings after moving to Denver, Colorado. Reverse culture shock didn't hit right away. We were so busy moving and taking care of our then 6 month old son. But when it did hit, the shock was strong. And it is still lingering. I find myself searching for anything that comes even remotely close to our life in Tokyo. Typically this means trying to find the perfect bowl of ramen, the best sushi, and perfectly a Japanese curry recips. This is easier said than done because, in the case of food, Japan always does it best. What does all of this have to do with a fennel and blood orange salad? Nothing at all. Except that when I made this salad all I was doing was thinking of life in Japan. That previous life consumed my thoughts for an entire day. That's the way it goes, I guess. It is also possible that I am using this salad as a reset button. Both to reset my weekly eating habits and to start with something clean and fresh in my mind. Whatever the motivation, I was pleased to have something fresh and bright on my plate. If you haven't tried shaved fennel with citrus, I encourage you to get on that right now. This is the perfect time of year for blood oranges, grapefruit, Meyer lemons... And I think with all the snow and negative degrees happening out there, some vitamin C might be just what we all need. So here's to salad. And citrus. And reverse culture shock. And reset buttons. Using a sharp knife or mandolin, save the fennel bulb. Place in a large bowl. 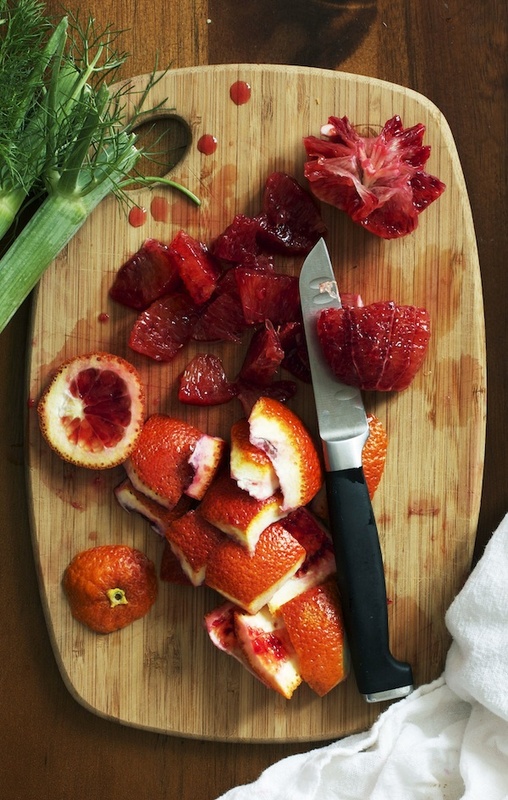 Peel the blood oranges and use a pairing knife to cut segments. Simply take the knife and cut on either side of each membrane (the part of the orange that shows you where each segment is). Arrange the segments on top of the shaved fennel. Sprinkle the salad with the chopped almonds. Next, make the vinaigrette by combining the orange juice, vinegar, olive oil and salt in a small bowl. Whisk until emulsified and drizzle over the salad just before serving.